At 20+ hours by bus from Santiago or a ten hour ride from the nearest city in Argentina, this remote desert might seem out of the way, but if you are traveling through South America, make time for at least a few days here. We loved it so much, we came here twice. 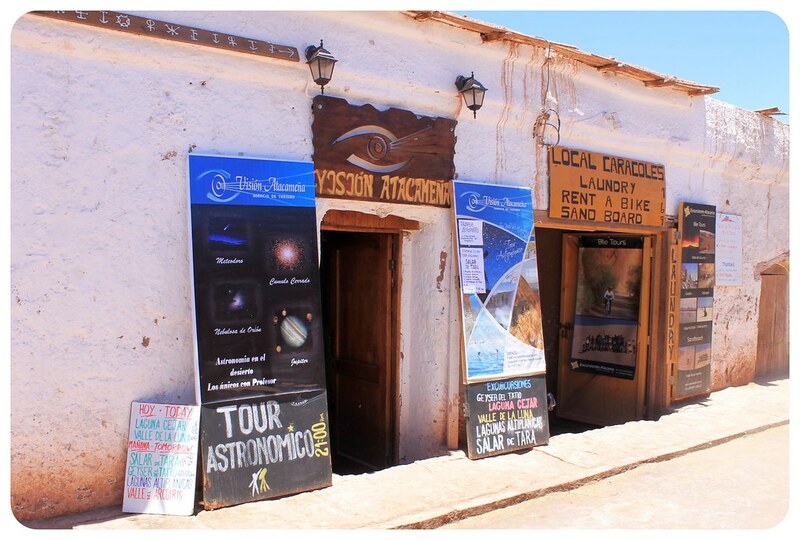 San Pedro de Atacama is the main base town for the area and it is stuffed with travel agencies on every street in the center, especially Caracoles, the main drag. Each offers basically the same tours, with varying prices and services included. As Chile – especially San Pedro – can be fairly pricy, we opted for the less expensive agencies and feel that we had the same quality tours as those who went with agencies that cost more. Many tour operators consolidate tourists to fill up vans anyway, so shop around for the best rates since you’ll likely do quite a few tours while in town. Do your research though, as you’ll see below we got burned once by going with an agency with bad reviews. 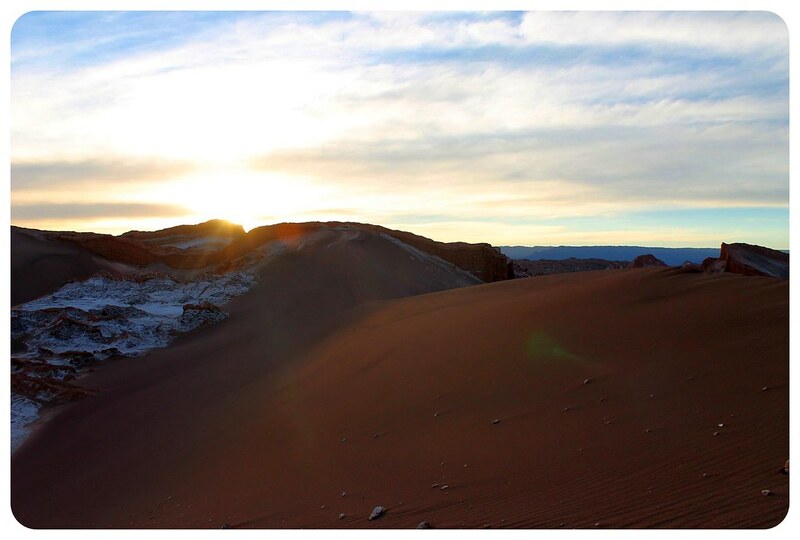 Read on to find out what we think you shouldn’t miss on a visit to the Atacama Desert. The Moon Valley and Death Valley have the benefit of being near to town, inexpensive and offering incredibly spectacular landscapes. If you only have time for one tour, we’d recommend taking this one. Tours run in the afternoon everyday from 4-8pm. 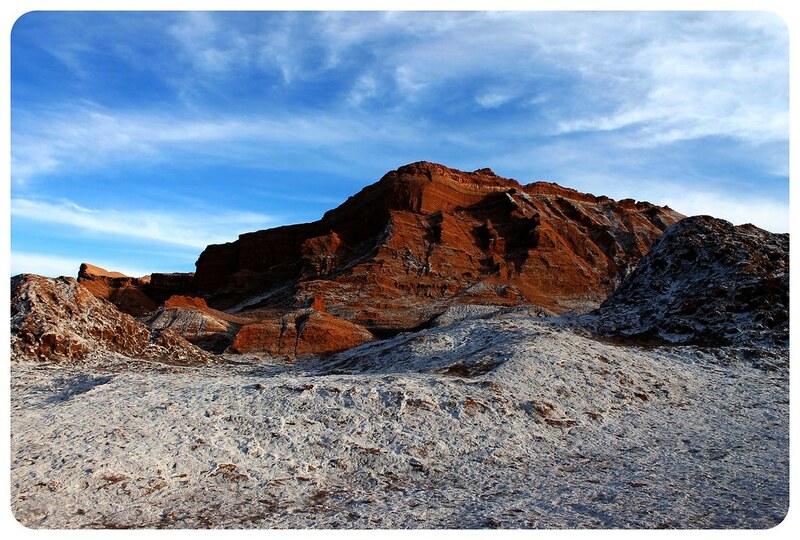 There is no question where the name Moon Valley (Valle de la luna) came from. 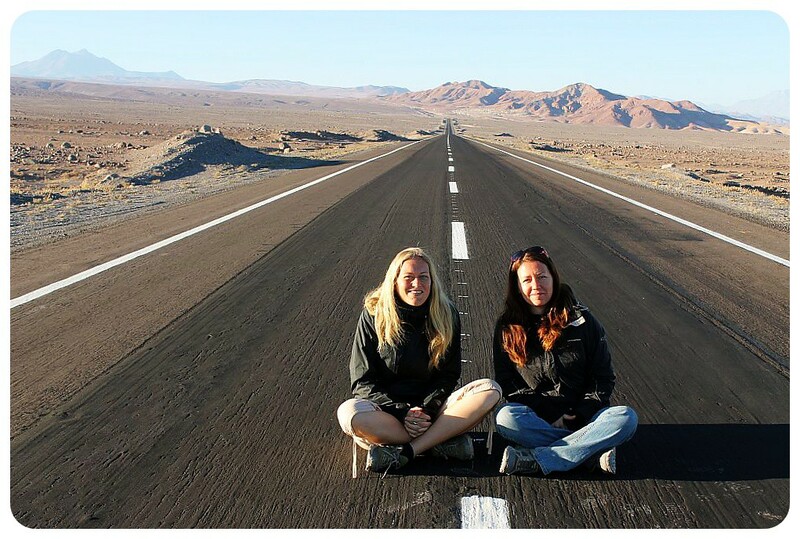 Like many times driving through the Atacama Desert, it is as though you hopped in a space ship and took a trip to space. 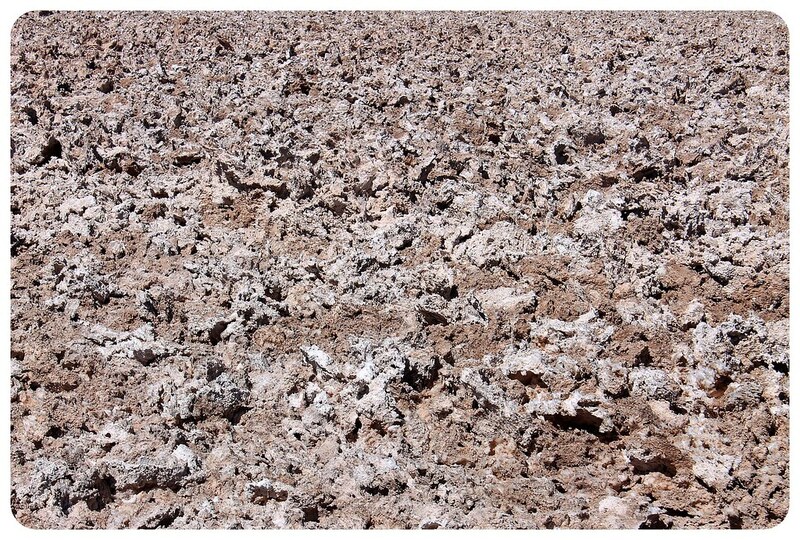 The landscape here is remarkably similar to the surface of the moon. Likewise, Death Valley’s name, in Spanish ‘Valle de la muerte’, came from people who got lost and did not make it out alive, although just as appropriate would be the fact that the absence of life (both vegetable and animal) and the lack of water make this the most inhospitable place on the planet. 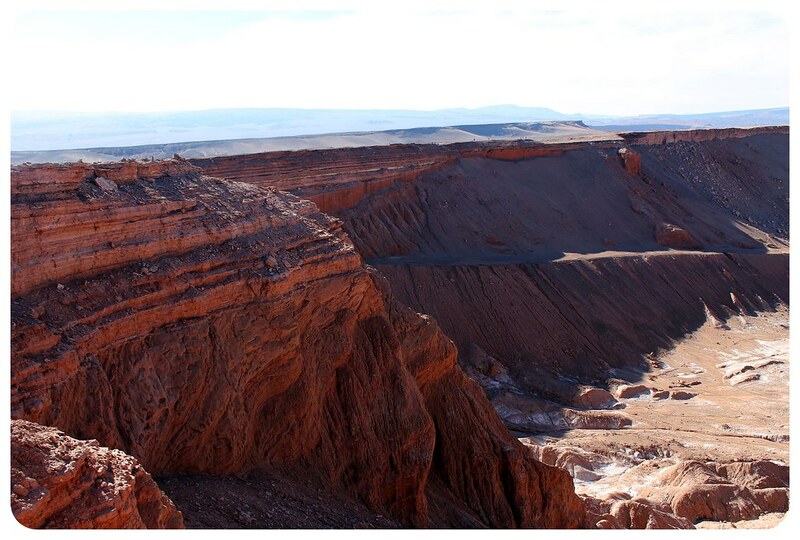 The Cordillera de la Sal runs between the valleys. 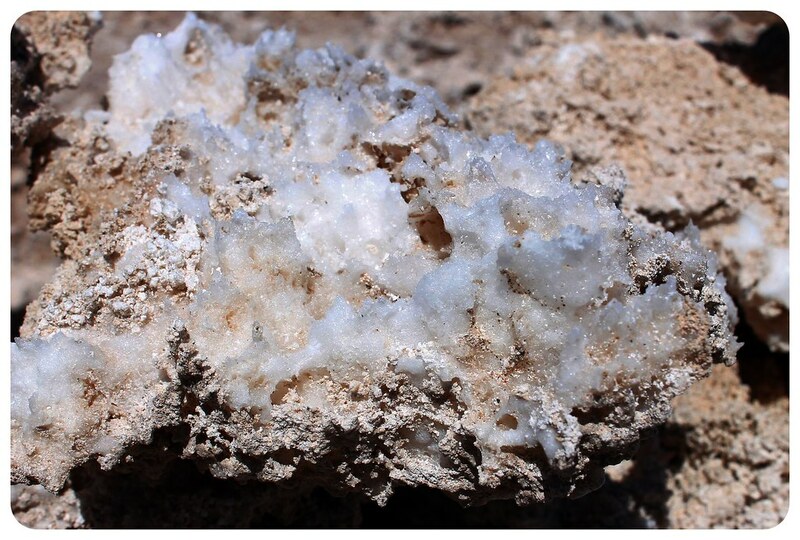 This mountain range is covered in a layer of salt and home to salt caves which you visit on these as well. There are bike rental places all over town who will rent you bikes and point you in the direction of these valleys, but here’s why we opted for an organized tour: you’d have to ride 35km round trip up a steep, winding road and the thin air at just under 8,000 ft left us breathless just walking around town. We just so happened to hop on a tour on one of the thirty days per year that was not cloudless, which ended up being a blessing in disguise. The tour drove out into the lunar scenery, to the moon, into salt caves, and finally to the top of the ‘Big Dune’, the biggest of all the sand dunes, for sunset. The colors that reflected off the clouds made this last stop spectacular. Real adventure enthusiasts can also opt to sandboard in the Death Valley. Most agencies offer sandboarding, too, but this tour doesn’t include all of the stops of the regular tour. PRICE: Most agencies run this afternoon tour for CLP7,000 to 8,000 ($14 – 16). Find out if the entrance fee to the valleys (CLP2,000 / US$4) is included in the tour you book. Sandboarding tours can be booked at several agencies and cost around CLP12,000 / $24. This whole altiplano region has salt flats including ones in northern Argentina and the largest of all in Bolivia’s Salar de Uyuni. 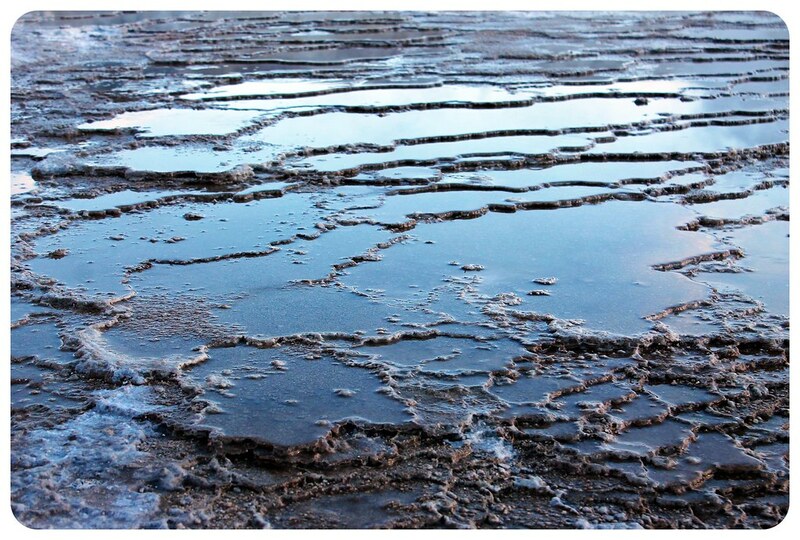 Out here near San Pedro, the Salar de Atacama salt flats are different. Instead of being white and flat, here the flats are more gray, chunks of salt and at first glance they might seem disappointing compared to others. But the lagoons, flamingos, even fish are all very visible, plus these are the third largest salt flats in the world. These giant grayish salt chunks span 3,000 square km (1,200 square miles) and are 100 km (62 miles) long and 80 km (50 miles) wide. 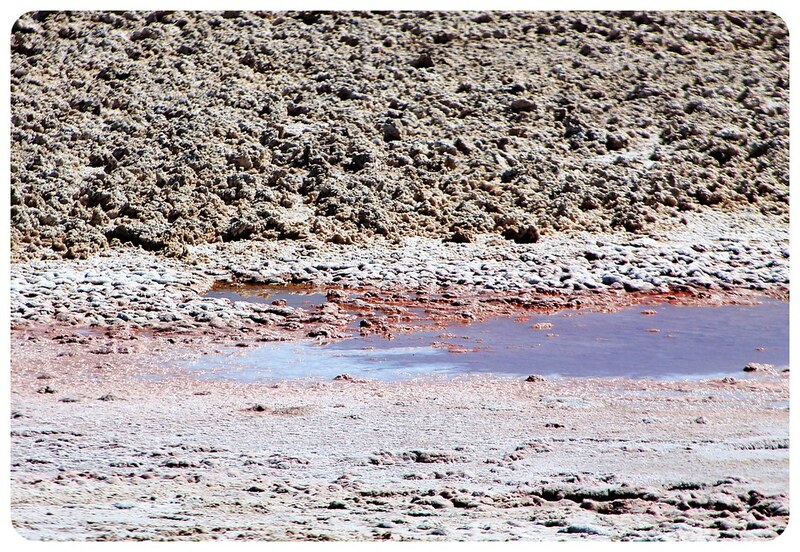 The highlight on the salt flats is the Laguna Chaxa, filled with hundreds of bright pink Andean and Chilean flamingos. The day trip, which starts at 8am, is very long grueling day driving 270km, but it is amazing to watch the vicuñas sprinting across the landscape that changes hour after hour but somehow always seems to look like you’re on Mars. 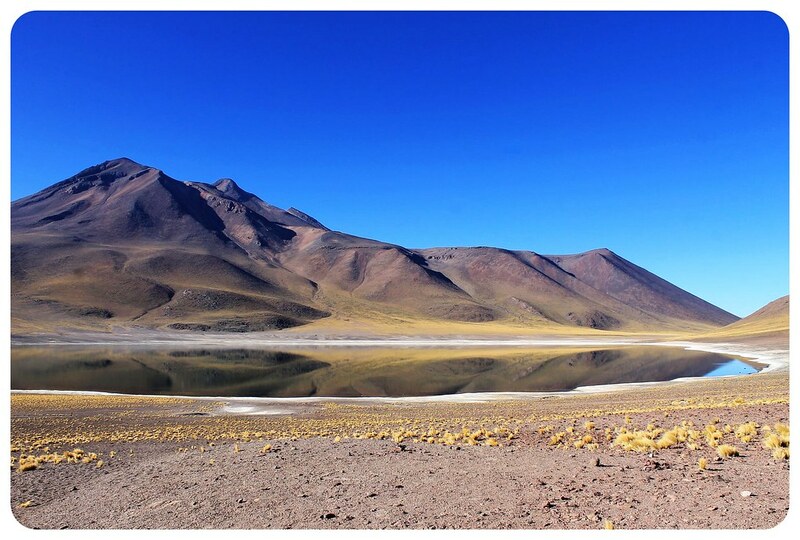 The first stops at Laguna Miscanti and Miñiques are gorgeous, cobalt-blue lakes at the foot of their respectively name peaks. The surface are like glass, or a mirror, with colorful surroundings of green and yellow grass and bushes to the clear blue skies. The last stop of the day is at the desert village of Toconao, famous for its buildings constructed entirely of Liparita volcanic stone and its iconic white bell tower built in 1750. 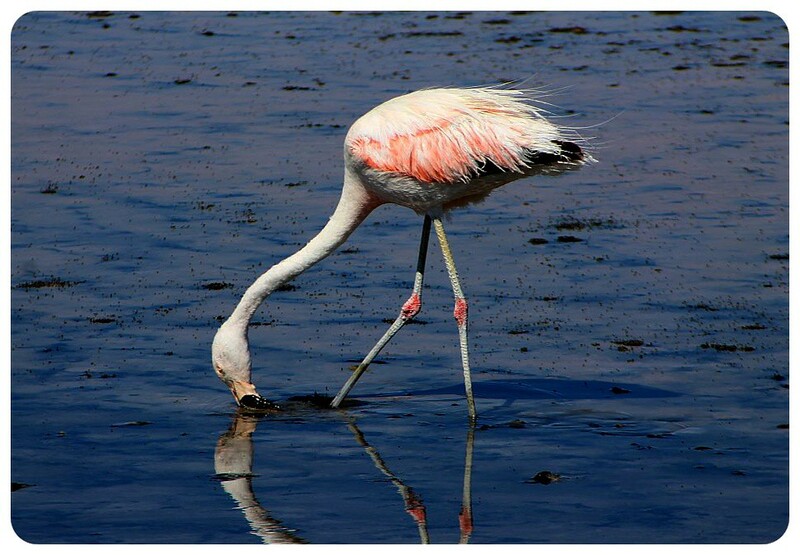 Tip: The Salar de Tara are also part of the Salar de Atacama and are supposed to be even more beautiful, with shallow lagoons and more flamingos, with less visitors. You need a 4×4 vehicle to get there, which is why most organized tours don’t go there. If you’re traveling in your own vehicle, the trip is well worth it. 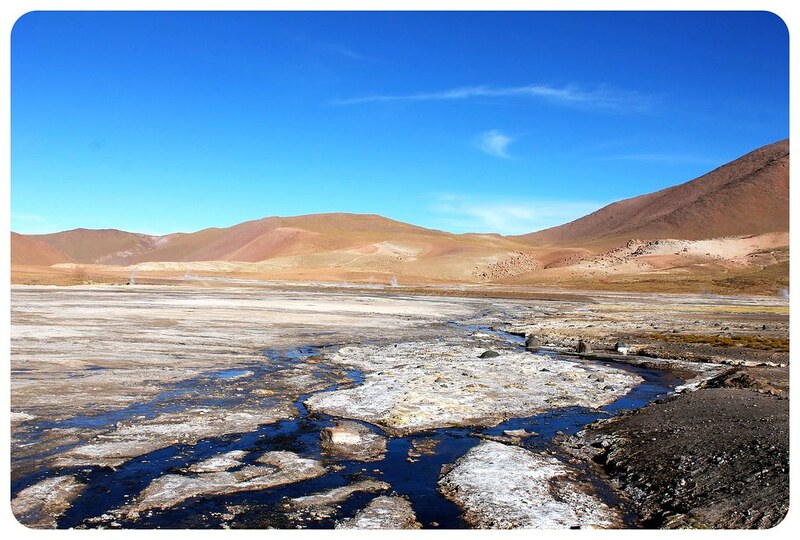 The Salar De Taca is 200 km south of San Pedro. PRICE: We paid CLP22,000 ($44) per person for the all-day tour incl. breakfast and lunch, plus an additional National Park fee of CLP5,000 ($10) per person. Getting up at 4am in the freezing cold desert darkness was entirely worth it to see the world’s third largest geyser field. Was it painful? Sure! 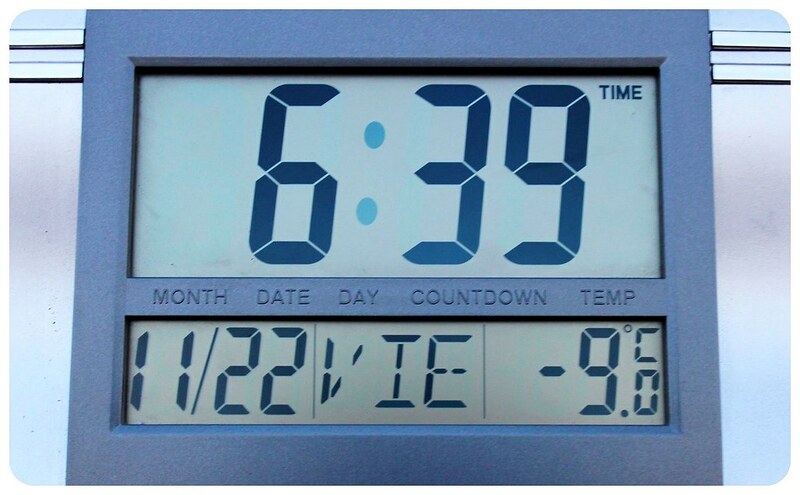 And not just the early hour – temps were -9°C (15°F) when we arrived at 6:30, which shouldn’t be surprising at 4,320 meters (14,174feet) just before sunrise. The sights are incredible. Just as the sun is rising, the steam from the boiling water bubbling and erupting into the freezing cold air creates this ethereal, entirely mystical feeling with some geysers shooting 10m (30ft) into the air. It’s not exactly Old Faithful, but the sheer number of geysers bubbling up make this such an beautiful experience. 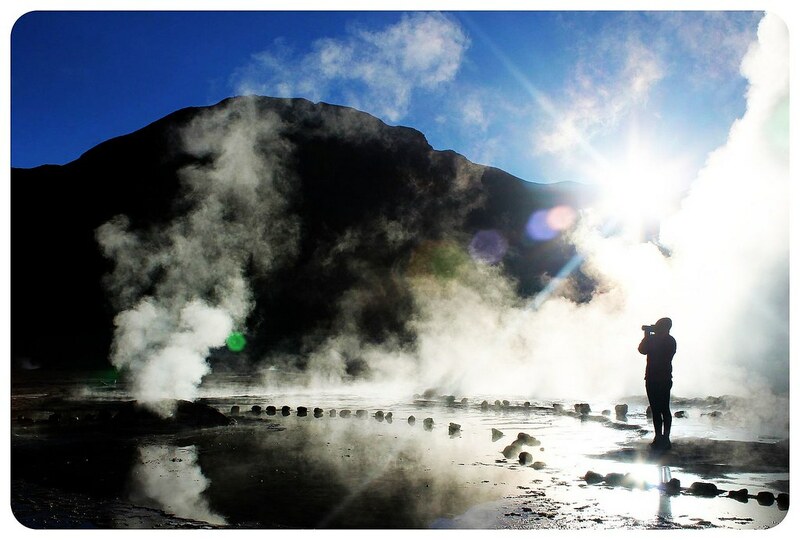 After walking around the geyser fields, taking pictures and learning some facts about El Tatio, we had a picnic breakfast with warming coffee during sunrise. 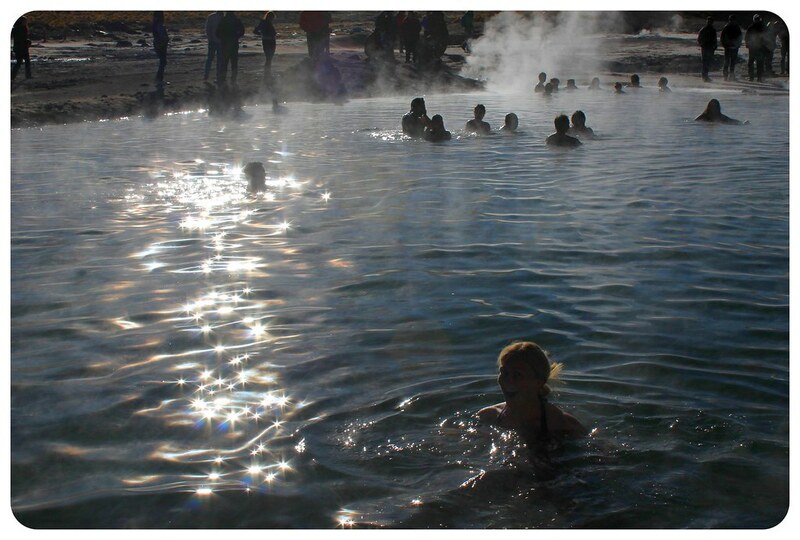 The next part of the tour is for the brave…for those who are willing to strip down to their bathing suits at 8am, the 35°C / 95°F hot springs are the perfect antidote to the bone-chilling temperatures earlier that morning. I was willing to do it, and found that the water was only warm enough in one corner, right where the boiling water came out of the earth. Jess stayed dry and watched in amazement instead. 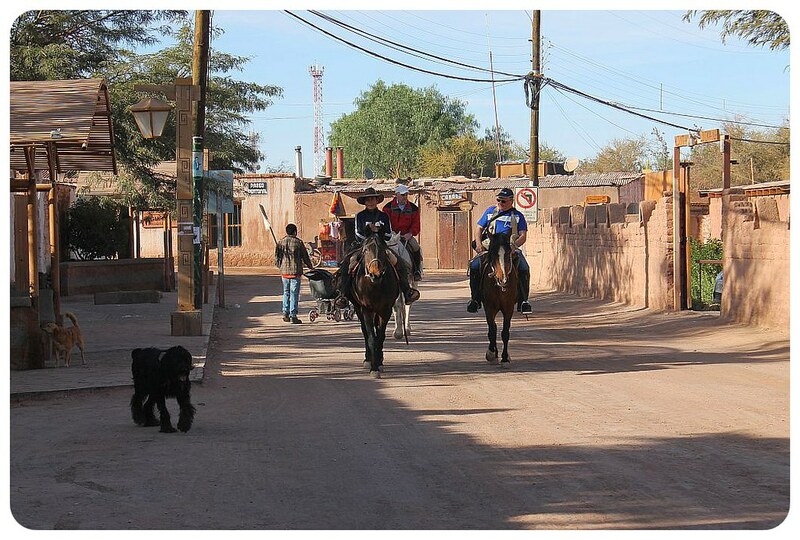 The tour also stops at a tiny village named Machuca on the way back to San Pedro, barely more than a few houses smack-dab in the middle of the desert. The town has incredible history, but today it seems just to cater to tourists for the tour groups returning from the geysers, selling food (vicuña skewers which were popular with the meat eaters and mediocre cheese empanadas for us) and a toilet stop. INFO: The tour lasts from 4.30am – 1.30pm, and covers around 200km. The maximum altitude is 4,320m. Make sure to bring enough water and sunscreen. We paid CLP20,000 ($40) per person for the tour. TIP: This tour shouldn’t be done on the first or second day of your stay in San Pedro due to the high altitude of the geysers. Sadly we ran out of time to visit Laguna Cejar – often considered to be one of the most remarkable experiences around San Pedro. Some tourists do cycle the 18 kilometers from town, but again 36km at this altitude is a bit too intense for us. The reason you might want more time there is because you can float in the lake like the Dead Sea thanks to its high salt concentration. 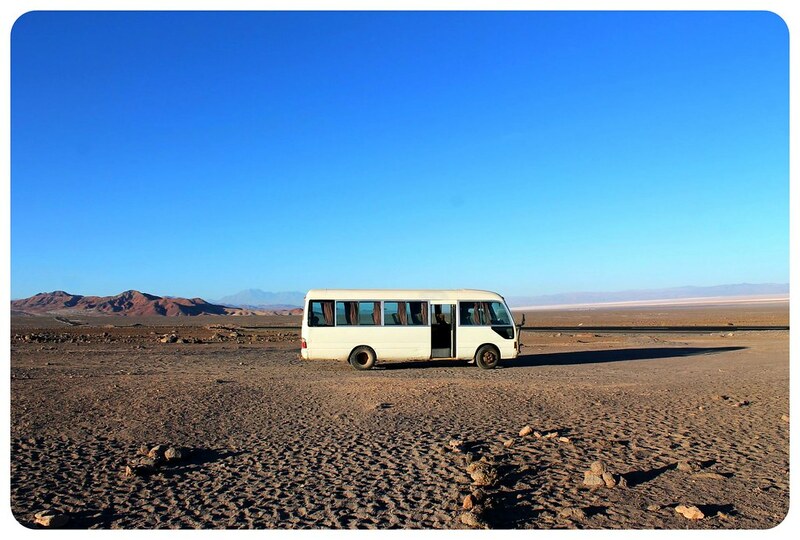 The tours to the Laguna usually leave around 4pm for time in the lake, sunset and a glass of pisco sour. PRICE: Tours to Laguna Cejar range from CLP8,000 to 10,000. ($16 – $20). The Pukara de Quito is a pre-Inca fort from the 12-century that sits in a stunning steep hillside location three kilometers outside of San Pedro. This distance can easily be cycled or even walked in 45 minutes. This fort has two impressively carved faces as well as an arch etched into the wall of the rock. The views over the valley from here are also worth the trip! PRICE: Admission to the fort is CLP1,500 ($3). 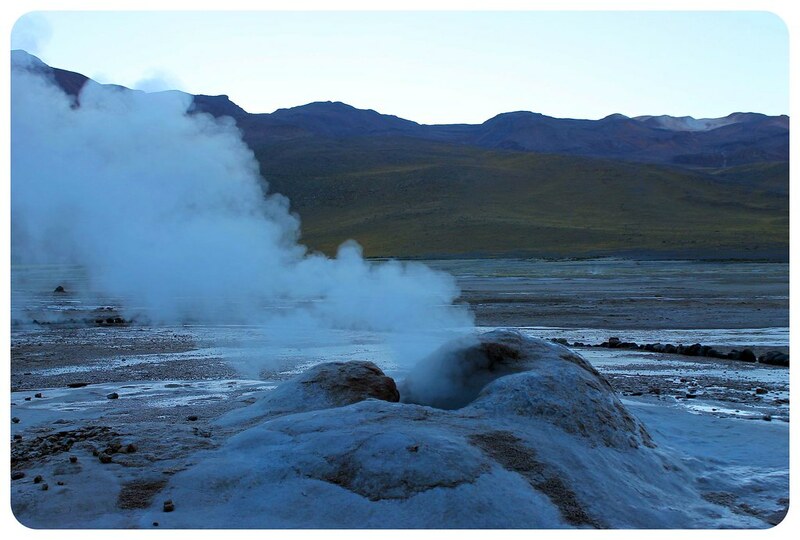 The Puritama Hot Springs, 28 km north of San Pedro, are supposed to be the most scenic hot springs in the Atacama Desert. Located at the bottom of a small canyon at 3,475 m (11,400ft), this series of eight volcano hot springs has pools and falls heated by the hot water of the Puritama River. The springs are administered by the luxury Explora Hotel, so there is also a sauna, a waterfall, other facilities and food available on site as well. The Puritama Hot Springs make for a nice splurge if you’re looking for a relaxing day in a stunning environment. You can get there by cab from San Pedro or join an organized tour. PRICE: CLP8,000 ($16) per person. Because of its clear skies, high altitude and almost zero light pollution for near-perfect visibility, the Atacama Desert is an optimal spot for stargazing. Even without a telescope you can see more star constellations from here than almost anywhere on Earth, which is why there are also a number of high-tech observatories run by NASA or ESA here. The perfect middle ground is to take an actual stargazing tour to learn more details about these constellations and galaxies and the differences in what you see from the northern and southern hemispheres. On our tour, the company brought two telescopes out to the desert and showed us the stars that make up the Southern Cross, the moon, Saturn, the Jewelry Box star cluster and more. Unfortunately this was the tour we were most looking forward to and subsequently most disappointed by. We didn’t research well enough beforehand and just chose a random tour agency. It turns out that the company we went with, Vision Atacamena, is actually one of the worst-rated in town. We had 30 people, two telescopes and we ended up standing around fairly bored for three hours, in the very cold dark desert evening. Plus our guide did not have good English OR Spanish (at least not for astrology), but we have heard several people raving about their stargazing tours, so check TripAdvisor first. Either way, the night sky here is breathtaking, packed with more stars than we had ever seen. PRICE: Stargazing tours are around CLP15,000 ($30) and include a hot drink or wine and some snacks. These go to several places around San Pedro including Moon Valley and Death Valley. La Herradura is supposed to be the best provider of horseback tours. One of the most popular hikes is the all-day Moon Valley and Death Valley hike from San Pedro, but there are also guided hikes to places that can only be reached by foot or bike and aren’t part of any of the tours. 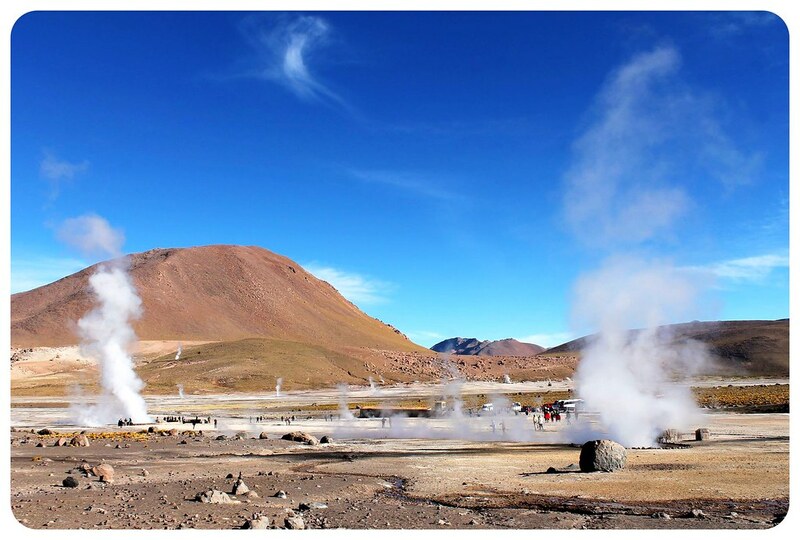 Guided cycling tours range from 2hours to all-day trips, even all the way to El Tatio Geyser! See the section on the Moon Valley and Death Valley (above). This is one of the most popular activities in San Pedro! There are several mountains around San Pedro that can be climbed, including volcano Lincancabur. You can get information in most travel agencies. Even if you stayed longer in San Pedro, it’s not economical to do all these tours. We recommending choosing a couple based on your time and interests, making sure to combine various types of landscapes. 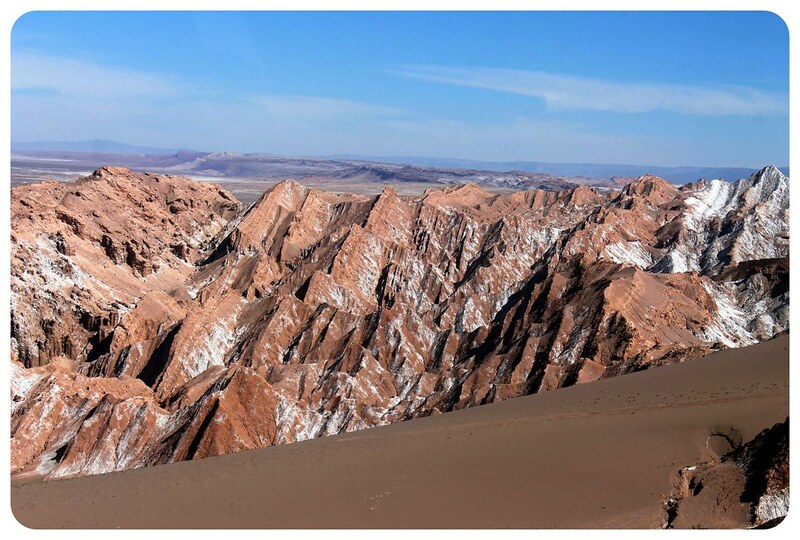 Consider doing the all day Salar de Atacama tour one day and then the late afternoon Moon Valley tour the next, for example. 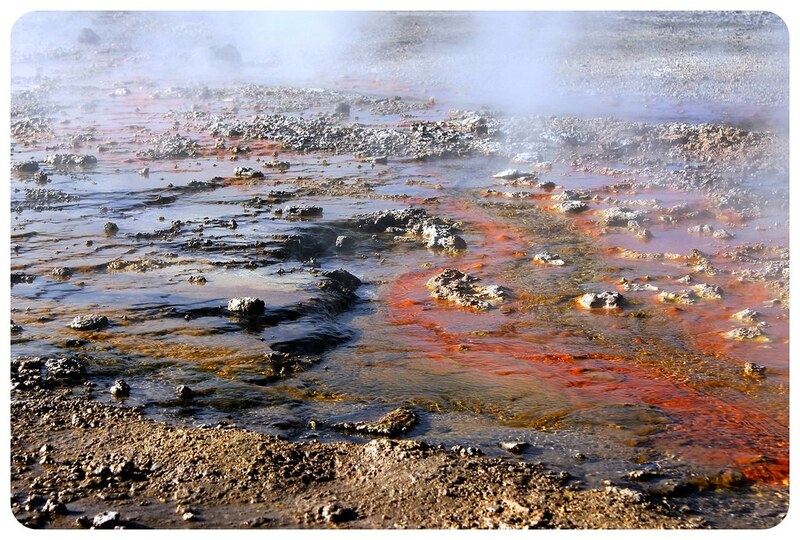 Or the early morning El Tatio Geyser tour one morning and the Moon Valley the next afternoon. 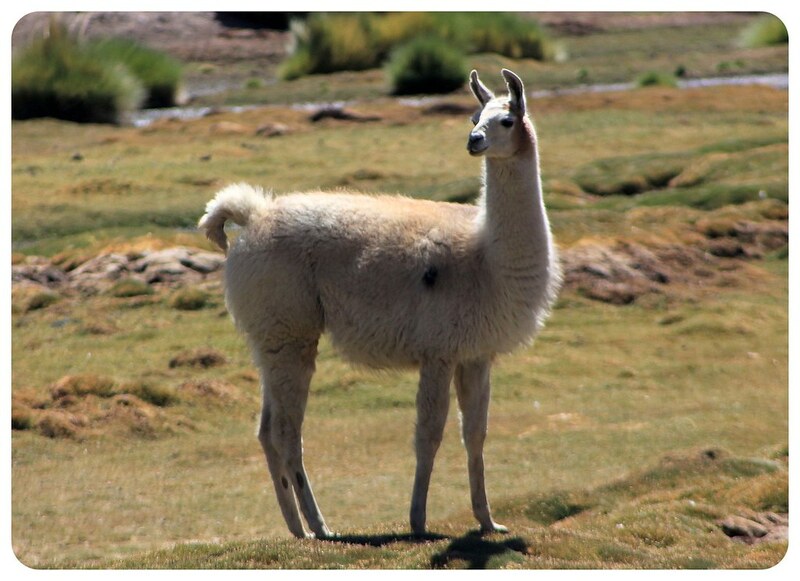 On a tight budget, walk to the Pukara de Quito and cycle to the Moon and Death Valleys. Bicycles can be rented from around CLP3500 ($7) for 6 hours or CLP6000 ($12) for 24 hour anywhere in town. 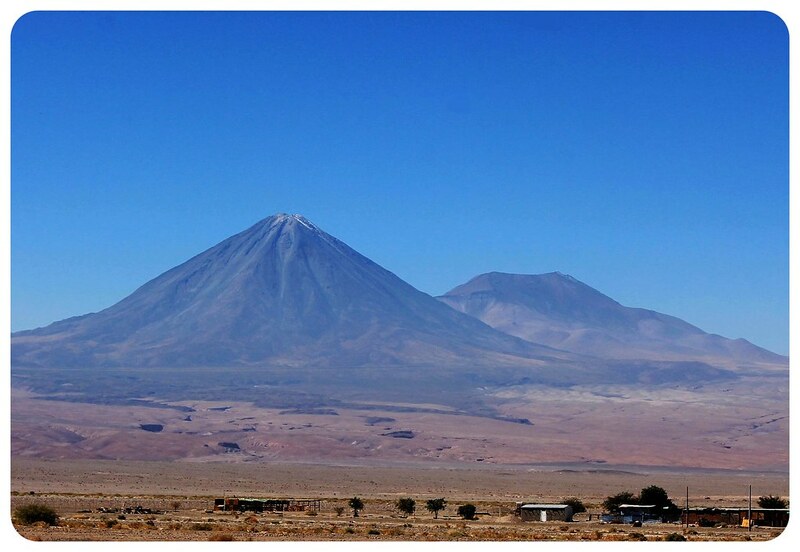 Wikitravel has some great advice on how to cope with issues like altitude sickness, solar radiation and other health concerns in San Pedro De Atacama. Take these seriously as the combination of high altitude, dry air and strong sun make this an very intense environment, especially when your tours have you waking up early, going to bed late and spending a lot of time out in the elements. Another tip that used to be true is that it makes sense to buy all of your tours at once from the same agency. They’ll often give you a discount if you commit to more than one tour. Great post. I am going to South America at the end of the year so I will making use of these tips! 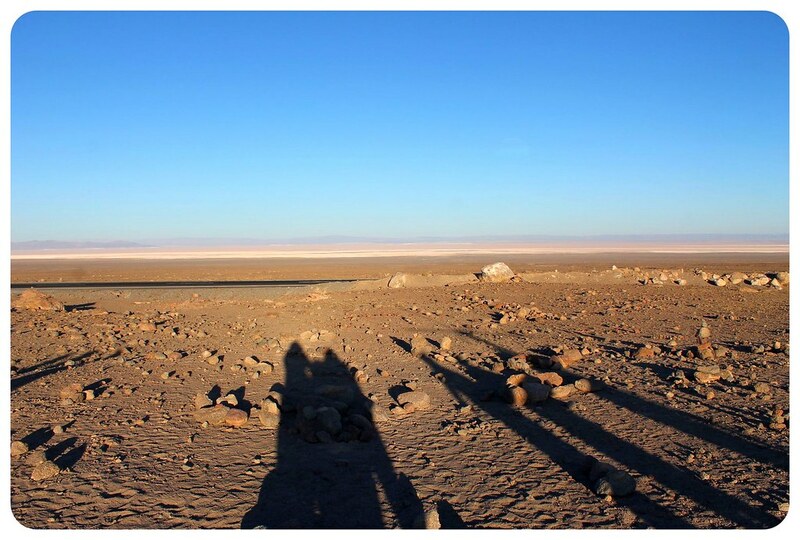 Pingback: Loving the Atacama desert with a tour • Where Is Your Toothbrush? 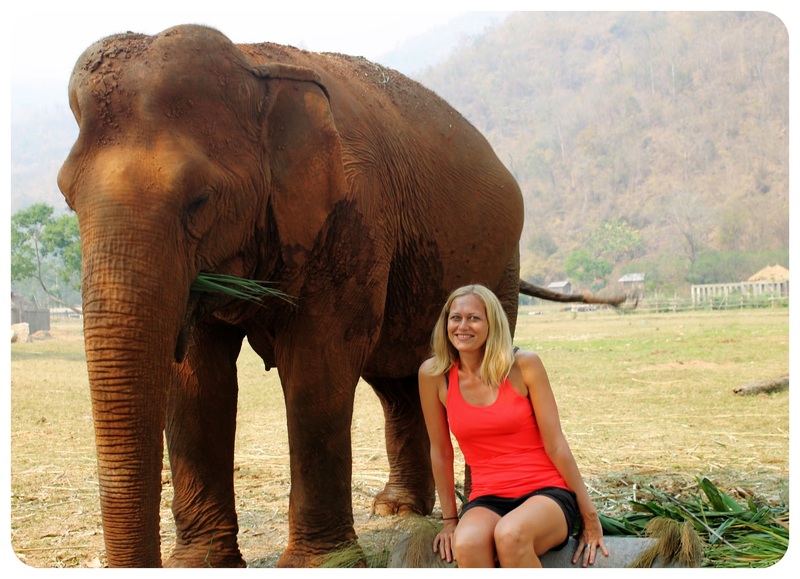 Was happy to come across your blog – great info for trip planning! 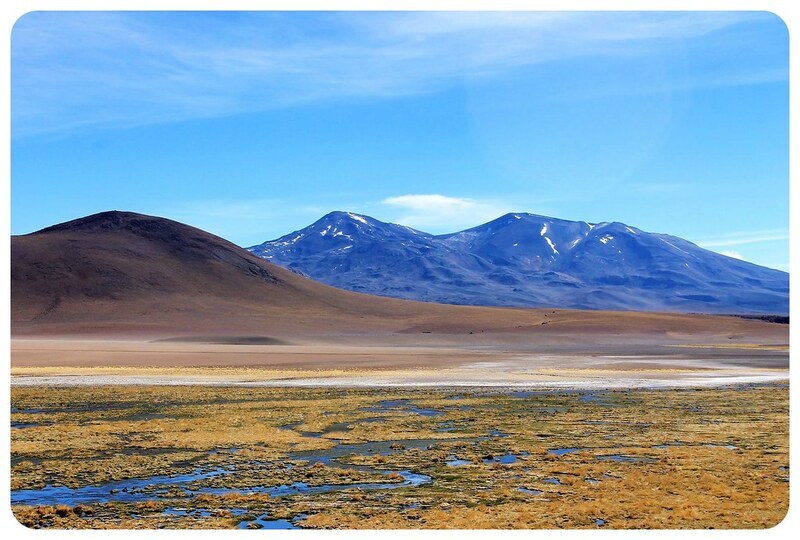 Just curious how the Atacama desert compared to Bolivia’s Salar de Uyuni in terms of scenery? 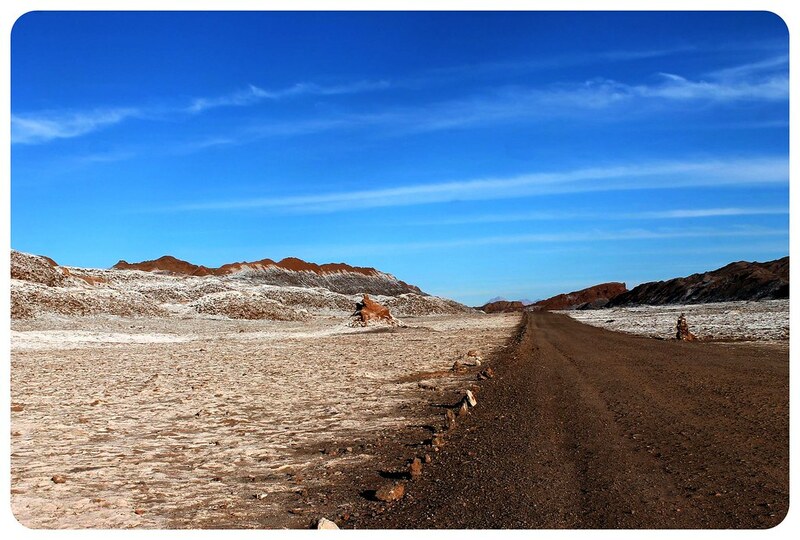 Some have said that the Atacama sites are just a light version of Bolivia’s salar tours. What did you think? We don’t have time to go both.. 🙁 On this trip anyway! 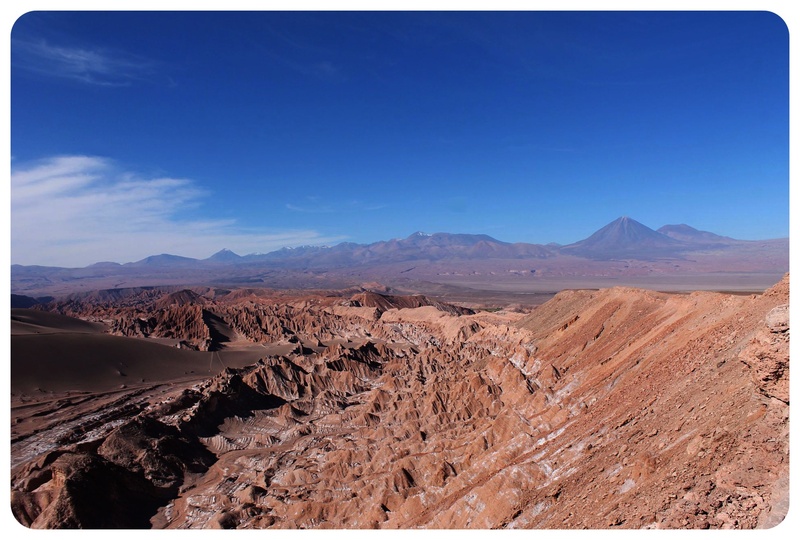 The Atacama Desert was very different. I would maybe try to fit in the afternoon tour of Moon Valley and Death Valley to get a teaser of the desert, if you stop in San Pedro at all. That tour is also cheap. But do not miss Bolivia’s Salar de Uyuni and try to go on the three-day trip which covers so much more than just the salt flats (sadly I haven’t written about it yet but will shortly). when are you going? We are going in two weeks! 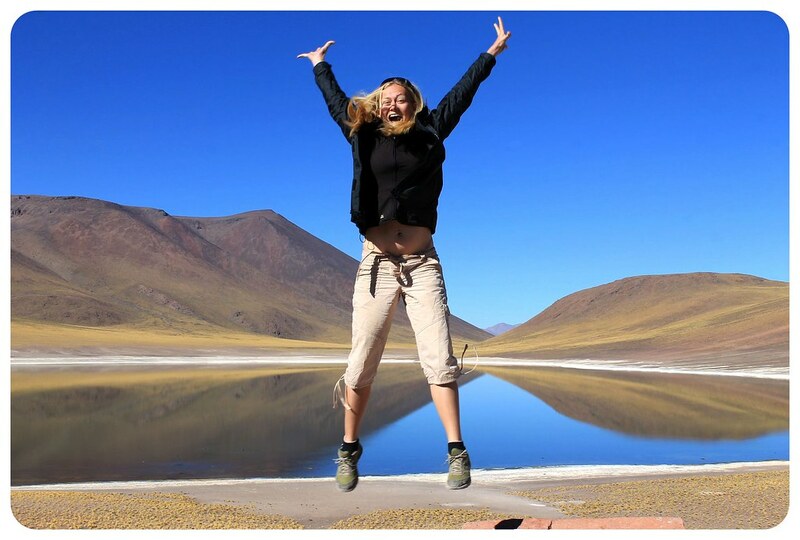 We are going to Patagonia on the same trip so to make it to the Salar de Uyuni, we would have had to fly up north right after our hikes, go on the tour, and immediately fly home from Santiago. The costs to do this during peak season was too much! 🙁 We decided to take our time and go by bus to Valparaiso, La Serena and the Elqui Valley (your blog post convinced us!) 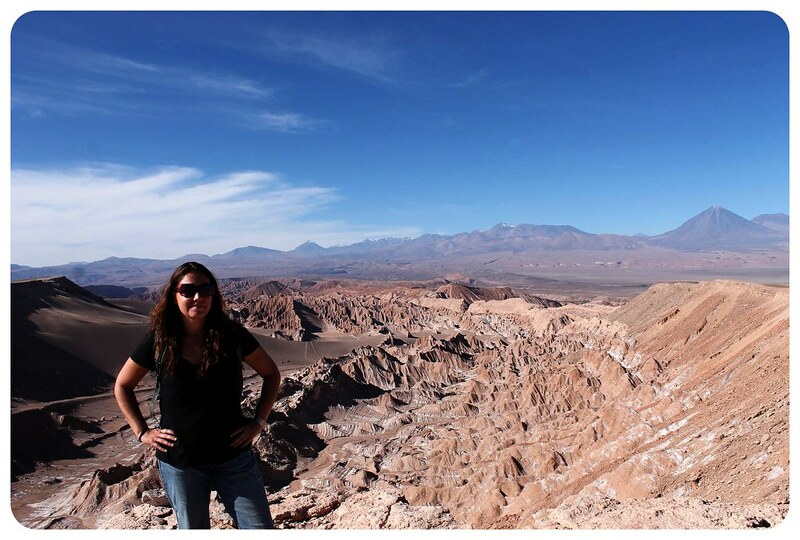 and then the Atacama Desert for 3 days before heading home. Maybe when we eventually make our way to the Salar de Uyuni, we’ll have more time to spend in Bolivia and maybe then even Peru! Hope you’re having a good time in Sri Lanka – that too is on my radar!! Can you recommend a place to stay in the area that is convenient for exploring and taking tours? Hi Katie, I’d try to stay as close to San Pedro’s town center as possible. There are some hotels further away but some of them require a shuttle / taxi every time you want to go into town and others require a long walk back home from the town center without lights. I recommend using the map on Booking.com when looking for a hotel, that way you see straight away how far the hotels are located from the town center. Another thing- all travel agencies that run the tours pick you up from your hotel (and drop you off) but that said, you’ll most likely want to go out for dinner, etc, and all the restaurants are in the (tiny) town center. I’m planning a trip here and it’s so great to get all this info in one place. When you say the day trip to the salt flats was grueling, do you mean because of the long day with lots of driving or were there physical things that made it hard too? My husband and I are going to have our twin toddler girls with us and they’re pretty adventurous but toddlers are toddlers and I don’t want to plan anything that will be miserable. Thoughts? Thanks! Hi Jules, I think I meant the drive, because it was off-road pretty much the whole time, going over rocks and pebbles, and it was a lot of driving that day. Not sure how I’d feel about doing it with a toddler, to be honest… Tough call!! 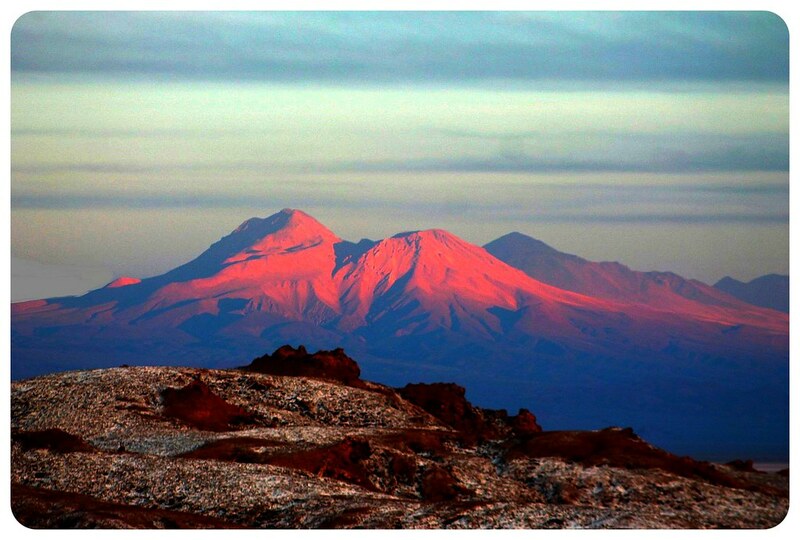 How many days do you suggest spending in the Atacama desert? I’m a little short on time but don’t want to miss anything.